Skype set to unveil video calling for iPhone at CES 2011? Skype is expected to make an announcement about bringing its video-calling service to the iPhone at CES 2011 in Vegas next month. 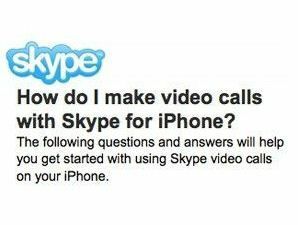 A keen-eyed Skype user spotted a mistakenly posted help document that revealed Skype will finally be bringing its video calling to the iPhone. Engadget noted that Skype has been telling everyone that it'll be making a "series of video-related announcements" at CES next month. Skype reps are set to participate in a panel at CES entitled "Video Calling Gets Ready for Primetime." This in addition to the 'Skype on iPhone' help document that was posted early all points towards a major mobile VoIP announcement on the way in Vegas. No word on Skype's plans to launch its video-calling on other platforms such as Android or BlackBerry. However, we will be on the ground in Vegas next month to bring you the official word from Skype regarding the future of mobile video calling.